The development of Joomla! 4.0 is the main target, but until this will be finished there are other versions being released: Joomla! 3.8, the latest in the Joomla! 3 series, has been released yesterday and it features over 300 improvements, with two primary major features aimed at developers: the new routing system and the beginning of a forward compatibility layer with Joomla! 4.0. Additionally, two security issues have been resolved. Joomla! 3.7.1 has been released a few hours ago - this is a security release for the 3.x series of Joomla! which addresses one critical security vulnerability and several bug fixes. The latest Joomla! version has been released a few days ago by the Joomla! Project. Joomla! 3.7 features over 700 improvements to the popular CMS, including many features which make administration of Joomla! Web sites easier and more feature-rich, as well as several security updates. You can find more information about the sujbect here. Joomla 3.7 will be available soon with 40 new features and more than 700 new improvements (including custom fields, multilingual association and a new router). Stick around for our now improved Joomla extensions and update your Joomla when the time comes. The security release for the 3.x series of Joomla! is available since 13 December and addresses three security vulnerabilities, miscellaneous security hardening and three bug fixes. No further changes have been made compared to the Joomla! 3.6.4 release and our component works fine with both Joomla! versions. We strongly recommend that you update your sites if you haven't done this already. Find out what's new in 3.6.5. The combined releases address nearly 150 bug fixes and some medium/low priority security issues. There were some known issues when updating to 3.6.1. Read about them here. For known issues with the 3.6.2 release, see the Version 3.6.2 FAQ in the documentation site. You can download the latest Joomla! version from here. Before upgrading to Joomla 3.6.2 make sure that you first upgrade all your components, including core "Joomla! Update Component Update" component. The Joomla! Project and the Production Leadership Team have released the latest Joomla! version with more than 400 improvements, including features to improve your administrator experience and user experience improvements. You can download the latest version and find out what's new here. To find out the full list of the 3.6 features please visit Joomla! GitHub Repository. Our component was tested and it's working fine with this Joomla version. This email IS NOT sent by Joomla.org. It is sent automatically by your own site, ================================================================================ UPDATE INFORMATION ================================================================================ Your site has discovered that there is an updated version of Joomla! available for download. Joomla! version currently installed: 3.5.0 Joomla! version available for installation: 3.5.1 This email is sent to you by your site to remind you of this fact. The Joomla! project will never contact you directly about available updates of Joomla! on your site. This new feature is good, but it came only from a website. When you have several sites using Joomla it would be great if the update have been done by default, like Wordpress does. You can update your Joomla! using the backend feature on your site or you can download the latest version from here. 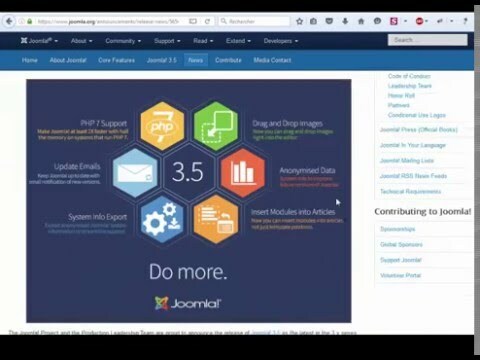 Joomla 3.5 and Community Builder 2.0.14 Released! Joomla 3.5 and Community Builder 2.0.14 have been released, and they are a lot faster requiring half of the memory use on PHP 7 environments. Our component, JEmbedAll, works perfect on this configuration, and you can download & install it to get the best Joomla experience. The latest version of Joomla! introduce 34 new features supports the most recent release of PHP, the most popular programming language for developing web applications recently announced with significant performance improvements and now available for use by the general public. More information + download packages are here. Community Builder 2.0.14 has been released with new features and bug fixes, it's highly recommended for Joomla 3.5 as it addresses a "Failed to start session" error on logout in the frontend introduced with Joomla 3.5.0 (a backwards compatibility issue). CB 2.0.14 came out with 3 new features and 13 bug fixes. More information about this can be found here. News - Golden Gravel, the best toolbox for #Joomla development: 5.0 out of 5 based on 1 reviews.